June 6, 2017 - Hamilton School District. The district will continue to contract with Teachers On Call (TOC) to provide substitute staffing services through June 30, 2019. The School Board accepted the recommendation from Human Resources and Organizational Development Director John Roubik to renew a two-year contract with the company that offers an automated process to secure substitute teachers and paraprofessionals. Because TOC provides services to more than 100 school districts in Wisconsin and Minnesota, its economy-of-scale allows for greater operational efficiencies than a single school district could produce. Consequently, substitutes are eligible for an enhanced compensation packet that school districts did not typically offer including paid holidays, bonuses, insurance and more. The hourly rate is set by the district, and a 27 percent mark-up to TOC covers payroll, benefits, retirement, taxes, liability, unemployment, workers’ compensation, background checks, physicals and other indirect personnel functions such as recruitment, monitoring compliance with state and federal mandates, time sheets, hiring and communication. A team of Templeton Middle School students were recognized for success in the annual Whipping Up Wellness Wisconsin Student Chef competition. Seventh grade students Lauren Baker, Lauren Kessen, Nicole Gall, Isabella Scheiber, Camden Gerke and Alexander Tong developed an original, student-friendly recipe that included legumes. Their recipe, Black Bean Enchiladas with Wild Rice and Corn, will be included in the student chef cookbook published by the Wisconsin Department of Public Instruction. Templeton family and consumer sciences teacher Rebecca Abler and district food and nutrition services manager Kira Cerroni King advised the Templeton team. Two Hamilton High School art students who earned awards in the 2017 Scholastic Art Awards were recognized for their success in the statewide contest. 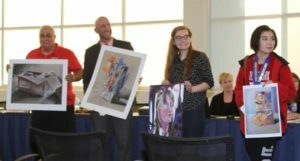 Hamilton art teacher Ellen Acuff spoke to the board about the artwork that her students created. Students who earned awards and were recognized at the School Board meeting were Emily Bader (third from left) who earned a silver key for drawing, honorable mentions for drawing and painting and Tora Kozic who earned an honorable mention for drawing. Lannon Elementary School Principal Brian Balfany and teachers (back row) recognized paraprofessionals from their school. Paraprofessionals who attended the meeting were: (front row, beginning second from left) Audrey Gauthier, Jean Fero, Melissa Harbort, Phyllis Frittitta, Betsy Molinski, Sarah DeCraene, Sara Doubek, Terri Weissbach and Jamie McMillan. Unable to attend the meeting were Karen Ullrick and Marissa Weber. The Hamilton Charger Robotics team which earned the FIRST regional Chairman’s Award for the sixth time in seven years and competed at the World Championships in St. Louis were honored. Robotics team leader Tora Kozic and facility advisor Lori Hintz spoke of the team’s accomplishments. approved the associate kitchen employee transfers of Julia Savatski from Woodside to Templeton and Kathy Nyhouse from Marcy to Woodside.